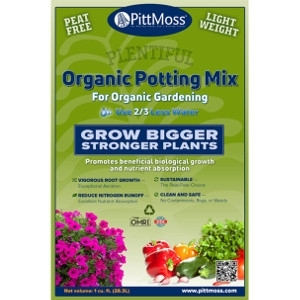 PittMoss® Organic Potting Mix is made from organic, recycled natural cellulosic fibers with added compost and mineral ingredients. Waste cellulosic materials that are normally land-filled are up-cycled into this valuable potting mix. PittMoss® Organic Potting Mix combines the best qualities of various types of potting mix and soil amendments with locally sourced compost.